Letter A Pendant With Chain. This is the letter A pendant set in gold tone with a 16" gold tone chain. The inside of the letter has a cream color enamel. Outside is shiny gold tone. The letter has a little different shape, seems to have a little swagger to it. It measures 1 1/4" long and 3/8" at the widest point. In mint condition probably from the 1980s. The chain is a rope design Pictures can be larger than actual size to show detail. Please check size in description carefully to assure you know proper size. Thank you. 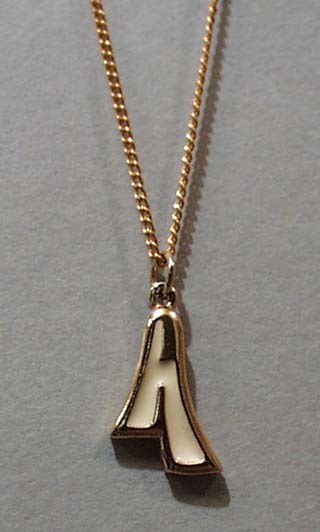 Items Similar To "Letter A Pendant With Chain"